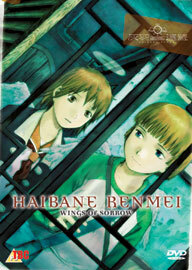 I was really taken with the first volume of Haibane Renmei, but this one was just stunning. The DVD begins much as the last one left off (refer to my review of volume 1), with Rakka coming to terms with her whimsical new world and helping out fellow Haibane Nemu in the library. But midway through the volume events take a very dramatic twist, and this is where it goes from being very, very good to absolutely superb. As mentioned the DVD starts off innocuously enough. Rakka is helping out one of the oldest Haibane, the sleepy looking Nemu, in the library and is the happiest she has been since her birth. She is intrigued by the books, which come from outside the towering walls that surround the town they live in, and reads them idly for hints of the outside world. She is also growing closer to the other Haibane in Old Home, but such good times cannot last and an unexpected event leads Rakka into a spiral of grief which could prove more dangerous than she realises. Whilst the first volume drew you into the halcyon world of the Haibane, this one really begins to scratch below the surface and there are several intriguing questions raised as the volume progresses. Crucially though it begins to delve in to the past of Reki, the chain-smoking but seemingly responsible Haibane who introduced Rakka to her new world. The pacing and handling of the episodes on this disc are such that before you realise it you are completely engrossed and when events take a particularly emotional turn you really care and fear for the characters. The grief that Rakka in particular experiences is perfectly expressed and will really strike a chord with anyone who has suffered in a similar way. I really love the fact that anime can have moments like Haibane Renmei. It is unique in visuals and story, with great animation and music, and is so perfectly paced that it manages that rare trick of telling you enough to keep you intrigued but crucially not so much that you lose interest. I personally cannot wait for the next volume - if this one had any kind of flaw then it is that there are only three episodes on it - so that I can further engross myself in Rakka's world. Anyone who is not buying Haibane Renmei is doing themselves a disservice, the series is proving to be the most intriguing, unique and watchable anime to be released in the UK. Do yourself a favour and buy it. Worst bit: Only three episodes on the disc - noooooo!!!! !